A few years ago, after reading through The Divergent book series, my daughter made this image. 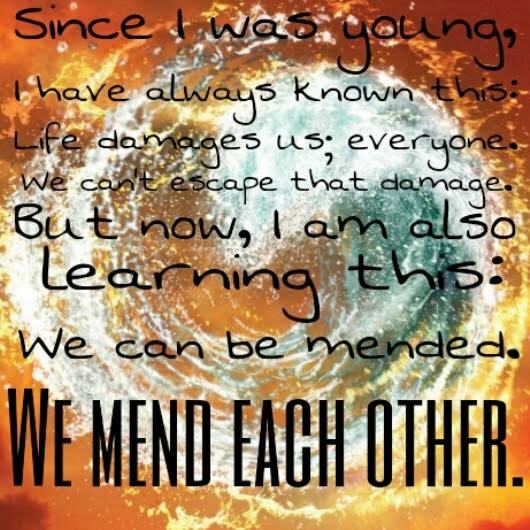 I love this quote from Allegiant. We can't escape that damage. What a beautiful picture of life. We all have wounds. Some are inflicted upon us by unknowing participants. Most are from those closest to us, who we love the most. They can even be wounds we have inflicted on ourselves. We carry those wounds through our lives and each new blow makes us a little weaker. A little more jaded. This quote always makes me think about The Hunger Games book series-there are many similarities between the two. In Mockingjay, which is the third book in The Hunger Games series, Peeta and Katniss come to this place in their lives where they have been beaten down. Two separate Hunger Games experiences have put them through tests no one should have had to face. A war after that has brought more pain and loss into their lives. They are two very broken people. Their relationships with others have been shaped by their experiences, to the point that they will not ever be able to experience the fairy tale happily ever after. In this brokenness, they cling to one another, because they finally realize that though their world can't be what they once dreamed it would be, they can find a semblance of joy through their pain and loss. They cling to one another, because they realize that though their wounds and scars run deep, they can heal. 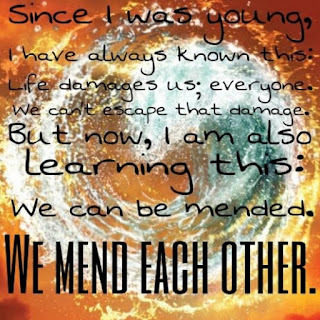 They can be mended. They finally understand that by sharing their grief and scars and lives together, they can help to mend one another. That thread of the story alone would have endeared that book series to me. I just think it's such a beautifully tragic love story. Peeta and Katniss have, by the world's standard, a really messed up relationship. They have caused one another pain and they have seen things that will haunt them until their dying day. And yet, they move forward and choose to share their pain with one another. It isn't perfect. Life never is. But it is enough. And together, they can heal and make something good from all of the bad. Isn't it great that we serve a God who takes all of our wounds and binds them up, and mends us? He brings good from all the bad. He puts people in our lives, who understand our pain and struggle, and uses them to bring healing. We are never left alone. Because the True Healer has designed us this way. He has designed us for relationship with other people. And this is a picture of what the church should be as well. Not some place we go and try to remain separate and secluded from everyone around us. It is a place where our wounds are welcome and where we can find others who will help us mend.